It is a large tree reaching a height of 37 meters, with diameters of 50 to 90 cm. It presents a long, straight, cylindrical stem. Albizia trees are described as a pioneer species in open, secondary or primary deciduous or monsoon forest and savanna and scrub vegetation. Wood diffuse porous. Colored deposits in heartwood vessels. Vessels per mm2 5 to 20. Intervessel pits small, 7 micras or less. Paratracheal axial parenchyma scanty and/or vasicentric. Axial parenchyma aliform. Axial parenchyma confluent. Prismatic crystals in chambered axial parenchyma cells and/or in fibers. 4 to 10 rays per mm (medium). Septate fibers present. Heartwood pale brown to dark reddish-brown or golden-brown with paler streaks and bands, sharply demarcated from the white to straw colored sapwood. Grain sometimes straight but usually interlocked or wavy. Texture moderately fine to moderately coarse and even. The wood is non-durable to durable in contact with the ground or exposed to the weather. 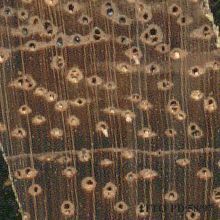 It is resistant to dry-wood termites but the sapwood is susceptible to Lyctus. The heartwood is extremely resistant to impregnation, the sapwood is permeable. Sawing of this species is reportedly easy to fair. 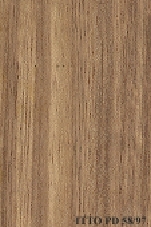 This timber is reported to be suitable for lamination. It has a moderate blunting effect on the cutting edges because of its hardness. The cutting tools should be kept always well sharpened. Planing of this species is reported to be easy. The response of this species to boring operations is good to fair. It is easy to mortise. Nailing behavior is reportedly fair. It takes a good finishing. Staining of this wood is easy. Painting or varnishing of this wood is rated as good to fair. It is reported to have a fair to poor response to hand tools. 42 - Utilización Industrial de Nuevas Especies Forestales en el Perú. 56 - Manual de Identificación de Especies Forestales de la Subregión Andina.